This marks the first in a series of posts delving into the process of making It Comes In Waves, an immersive theatre production conceived by bluemouth inc., written by Jordan Tannahill with bluemouth inc., directed by Jennifer Tarver, and presented by Necessary Angel, bluemouth inc. and PANAMANIA (presented by CIBC) on Toronto Island as part of the 2015 Toronto Pan Am Games. With my days as a Toronto Island theatre performer over for the season, I’ve chosen to begin by posting some music created specifically for the show. Phantom Love first emerged from writing by Lucy Simic (bluemouth inc.) and a guitar riff by Stephen O’Connell (bluemouth inc.) — both generated during initial development stages of the show. I fleshed out the music and lyrics, and then recorded and produced the track which was subsequently given some nostalgia-inducing ‘vinyl treatment’. During the performances (in the ‘Fireplace Room’ at the Gibraltar Point Centre for the Arts), the music was diffused through an 8-channel surround-sound playback system placed around the periphery of the room. 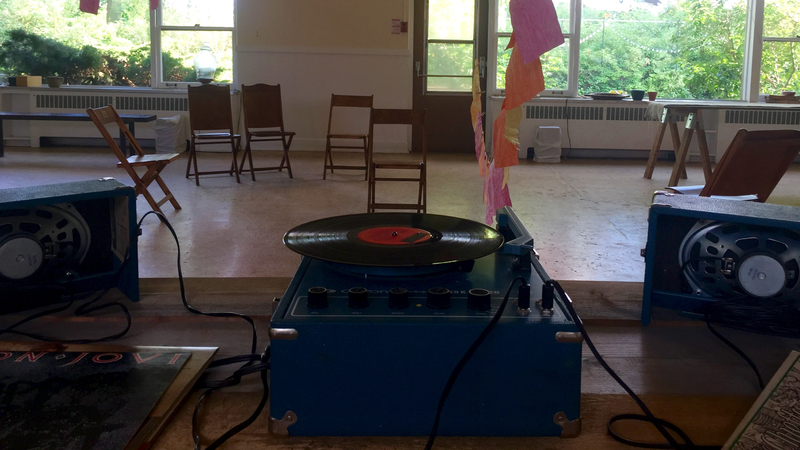 Playback began through two monitors located directly behind a vintage Califone portable turntable — which incidentally served as a fully-functional prop throughout the show. This effectively (though not entirely precisely) localizes the perceived source of the music, creating an impression that the music is emanating from the record player, until it gradually begins to rotate through the entire speaker system at a speed of 33 rotations per minute. The music accompanies choreography performed by Stephen and Lucy, which also travels around the room.